Spoilers Below!!! You have been notified. Big episode #3 tonight. 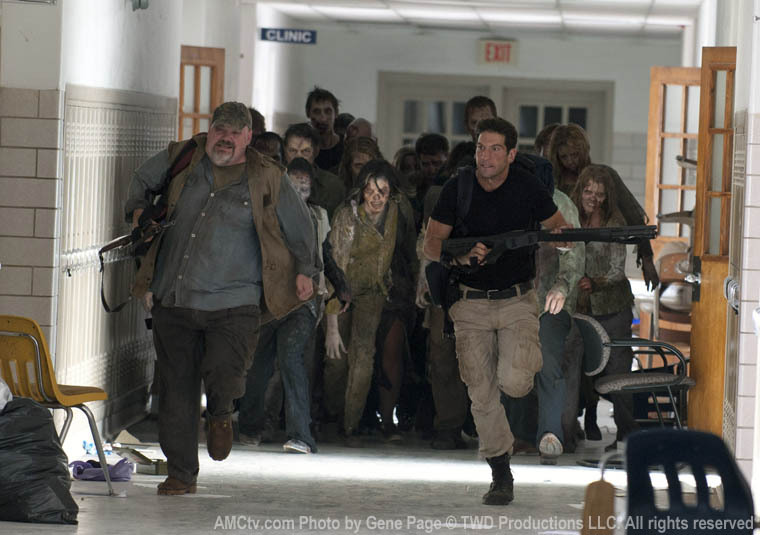 Shane and Otis trying to escape the walker infested school with the medical supplies that Carl needs to survive. Great stuff with an awesome twist/character moment at the end. Was basically waiting for Otis to become zombie late-night snack, but didn't guess at how he would die. When Shane arrived back, traumatized and obviously disturbed, you knew something wasn't right. His betrayal of Otis, while shocking, horrible and dramatic, wasn't a surprise--there'd been signs of what kind of depths Shane would sink to in order to survive and keep Lori and Carl alive. And last night we saw where Shane would go if he had to. It's a dark place, for sure--cold and ultimately concerned only with surviving, whatever the cost. I'm not sure where unstable/feral Shane is going to go, but I will be watching. Same lessons from last week apply--semi autos, magazine capacity, medical and communications gear. Having a doc like Herschel around sure would be useful post-TEOTWAWKI. Sewing up a cut is one thing, but any kind of surgery is going to require someone who has done more than watch some YouTube videos and read some books. Also, if Shane and Otis had some sort of melee weapons, things might have ended up differently. In the zombie apocalypse, you want something that doesn't run out of ammo as a last-ditch back up. The Shane/Otis incident brings up questions about morals in a survival situation--how far do you go to save yourself or your family? People have done lots of horrible things in the name of self preservation. Where do you draw the line? You want to your faith, beliefs and morals sorted out beforehand, because they will certainly be tested. What do you guys think? Morals and survival? Reactions to the Shane/Otis incident? What about Daryl the grief counselor or Lori's bout "we'd be better off dead"? Thoughts about keep others going after TEOTWAWKI? Next week's episode looks like a good follow up - can't wait!